The impressive Imperial Castle (Kaiserburg) of Nuremberg towering over the city illuminated by warm evening light. 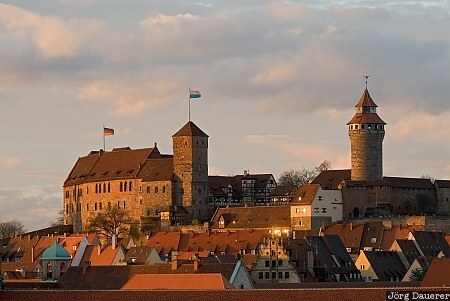 Nuremberg is in Middle Franconia, northern Bavaria in southern Germany. This photo was taken in the afternoon of a cloudy day in November of 2010. This photo is part of the exhibition Castles (June 2012). This photo was taken with a digital camera.